If you haven’t yet had the chance to experience a relaxing winter vacation inside a Gatlinburg log cabin, now is the chance. Not only do these rentals give you and your loved ones a quiet and relaxing place to escape during the cooler season, but they also come with a ton of amazing benefits that are sure to make your trip one to remember. To discover all of the reasons we think you will love spending winter in one of our amazing Gatlinburg log cabins, read below! One of the best aspects of staying in a Gatlinburg log cabin is you get to enjoy breathtaking scenic views no matter what time of year it is. However, these views are accentuated during the winter months because you will be able to see further into the distance. Unlike in the summer and spring, your view won’t be blocked by a thick forest of leaves. Although these views are beautiful in themselves, it is always nice to be able to widen your view to include more of the scenic beauty of the area, especially when it involves a clear sight of snow-capped mountains. Even though it is a little cooler outside, you can still enjoy spending the evening relaxing on the private back deck of your Gatlinburg log cabin by choosing to take advantage of the outdoor hot tub found there. Perfect for unwinding after a long day of exploring or simply enjoying the breathtaking views we mentioned earlier, these outdoor hot tubs are one of our favorite features our cabins offer in the winter. The best part is as the temperature drops outside, you can turn the temperature up in the hot tub to maintain a comfortable balance. Winter in Gatlinburg is one of our favorite seasons in the area, not just because of the cooler weather and scenic views. It is also time for the holidays! And what better way to celebrate this than inside a Gatlinburg log cabin, especially one decorated for the holidays. For us, the whimsical seasonal decorations help make the cabins feel like home during your trip. There are wreaths, Christmas trees, nativity scenes, nutcrackers, Santa Claus figurines, and everything else you need to to enjoy a memorable holiday experience with your friends and family inside a cabin. Click here to learn more about the benefits spending the winter in a Gatlinburg log cabin with your family. One of the things we love about being located in Gatlinburg is we get to enjoy a comfortable temperament throughout the year, including the winter. Although the outside temperatures are a little cooler this time of year compared to others, it is still significantly warmer than other possible travel destinations. Here, the weather doesn’t normally drop below freezing. The temperatures usually fluctuate between the mid-30s to low-50s, and occasionally we will see a day or two in the mid to upper-60s. This is the perfect weather if you still want to get out and explore during while you stay in your Gatlinburg log cabin because it is not so cold you will feel uncomfortable walking around and being outside. Instead, you can throw on a heavier coat and enjoy your day. Last, but not least, you and your family or group will love staying in a Gatlinburg log cabin during the winter because the rental rates are lower than they are during other times of the year. During the months of January and February, our already affordable rental rates drop to the lowest they are all year. 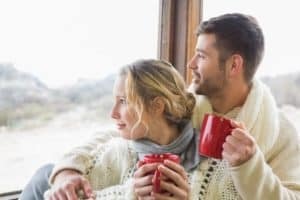 This means you and your loved ones can enjoy a fun and memorable vacation inside one of our relaxing cabin rentals while saving quite a bit of money on your trip. These lower rates are in addition to our many incredible Gatlinburg log cabin discounts we offer throughout the year. 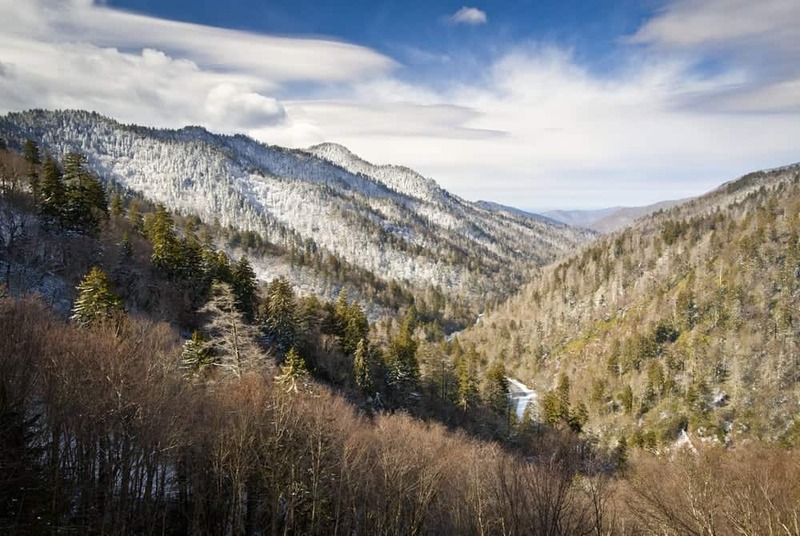 To start planning your next winter trip to a Gatlinburg log cabin today, browse through all the relaxing Gatlinburg cabin rentals in out inventory. From romantic 1 bedroom cabins to large 5+ bedroom cabins, we are sure to have just what you need to enjoy the perfect vacation experience.